The No. 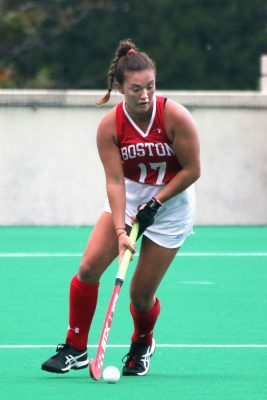 24 Boston University field hockey team continued to roll through conference opponents as it picked up a 5-1 victory over Lehigh University Saturday at New Balance Field. However, the Terriers (9-6, 5-0 Patriot League) lost 2-1 in a hard-fought game Sunday against the No. 5 University of Connecticut. It took only seven seconds in the fourth minute for BU to begin scoring against the Mountain Hawks (2-15, 1-5 Patriot League), that came into this game 0-5 against the Terriers. BU head coach Sally Starr said her expectations for the team did not lower despite the record. Senior forward Kara Enoch scored the first goal against Lehigh off of a cross from senior midfielder Allie Doggett. After this goal, Lehigh tightened defensively against further aggression from the Terriers, which continued until the 33rd minute in the half when sophomore midfielder Maggie New got past Lehigh’s defense and scored her first collegiate goal unassisted. The Terriers continued the attack in the second half when sophomore forward Ailsa Connolly scored two goals within two minutes of each other. The second half was finished off by freshman midfielder Rebecca Janes’ goal and a last-minute tally from a corner penalty for Lehigh with 29 seconds remaining in regulation. This totalled for a 5-1 Terrier victory. The win also awarded the team the Patriot League regular season title, its fourth straight in BU’s five-year history in the league. Twenty-five hours later, the Terriers returned to New Balance Field to host UConn (14-3), an offensive juggernaut that has outscored its opponents 70-21 coming into the game. In 2017, the Huskies went undefeated and claimed the national title. Despite a cold, windy day with the temperature feeling below freezing, the Terriers offense came in hot on the Husky defensive line. This aggression resulted in a penalty on the UConn defense, giving the Terriers a penalty stroke. Senior fullback Ally Hammel beat Husky goalkeeper Cheyenne Sprecher in the stroke and Hammel scored her fifth goal of the season and second of the weekend to put the Terriers on the board. Starr discussed the aggression the Terriers showed during the first half on Sunday. The Terriers could not hold this lead for the rest of the afternoon. Husky forward Svea Boker scored near the end of the first half, making the score 1-1 at halftime. The second half of the game was filled with aggression by both teams. In the end, UConn fullback Cecile Pieper broke the tie with 7:08 remaining in regulation for her 17th goal of the season. Despite outpacing the Huskies 4-2 in shots through the second half, the Terriers could not respond within the time remaining and fell 2-1. Starr said she knew that the team had a lot of energy playing. The Terriers will finish their homestand Friday with a game against the College of the Holy Cross at 6 p.m. and then travel to Chestnut Hill Sunday where they will finish out the regular season against Boston College. With the playoffs coming after these two games, Starr said she is making sure the team is focusing on one game at a time.